Few people can make a mess as quickly as I can. I decided to fill in the pool because during the summer it requires constant refilling with the hose, a pool in a dry garden looks silly, it was a breeding ground for mosquitoes, and it smelled terrible. The smell right now is something else. It’s on me, too. 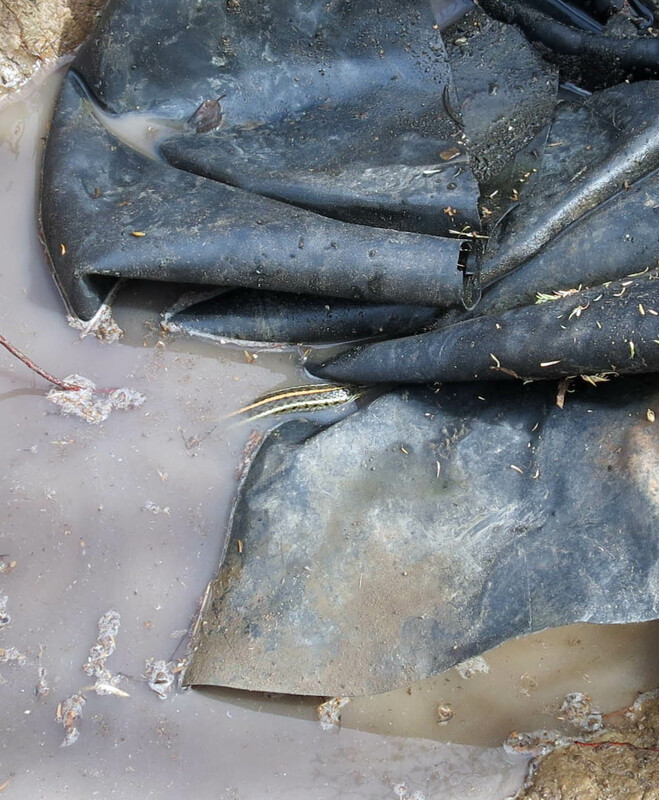 After I drained most of the stinky black water with a bucket, I noticed a large garter snake lying in the water. 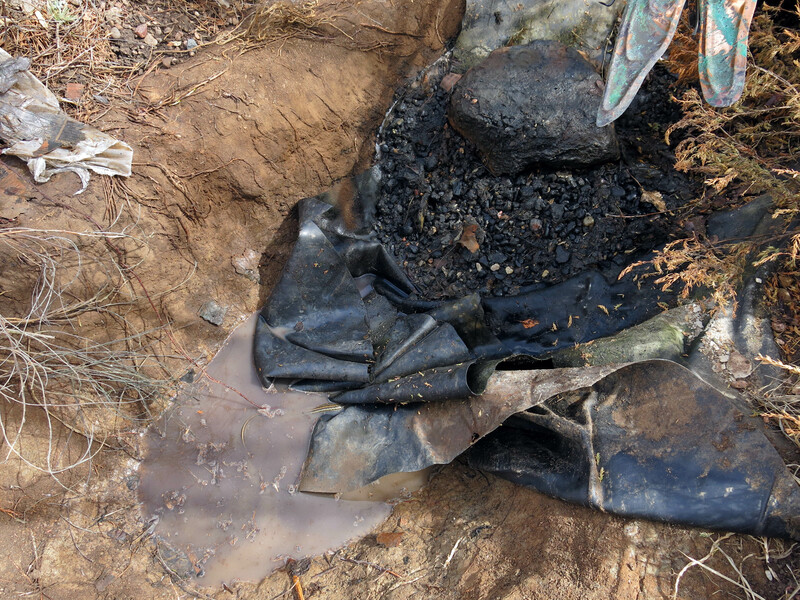 It’s visible in the picture above, and also here, slithering under the butyl rubber lining. I lifted the poor thing out of the ice-cold water, and set it in the sun to warm up, but it went back in the water again, so I moved it further away. There are pans filled with water around the garden expressly for snakes. I wanted to get this done before the next round of snow predicted for Wednesday. They (you know, “they”) predicted a low of 22 for Wednesday night, which would have been a record, but I notice they unpredicted that and now predict a low of 25. If this continues, maybe it won’t snow at all, and rain instead. Rain in spring; what a novelty. I now have to get out the wheelbarrow, the tire on which is still flat (I understand that tires stay flat unless you do something about them), and fill in the pool with a pile of dirt I’ve been saving for just this situation, and then take five showers. Somehow it’s not surprising that I can’t find people to work in the garden here. And there was this. 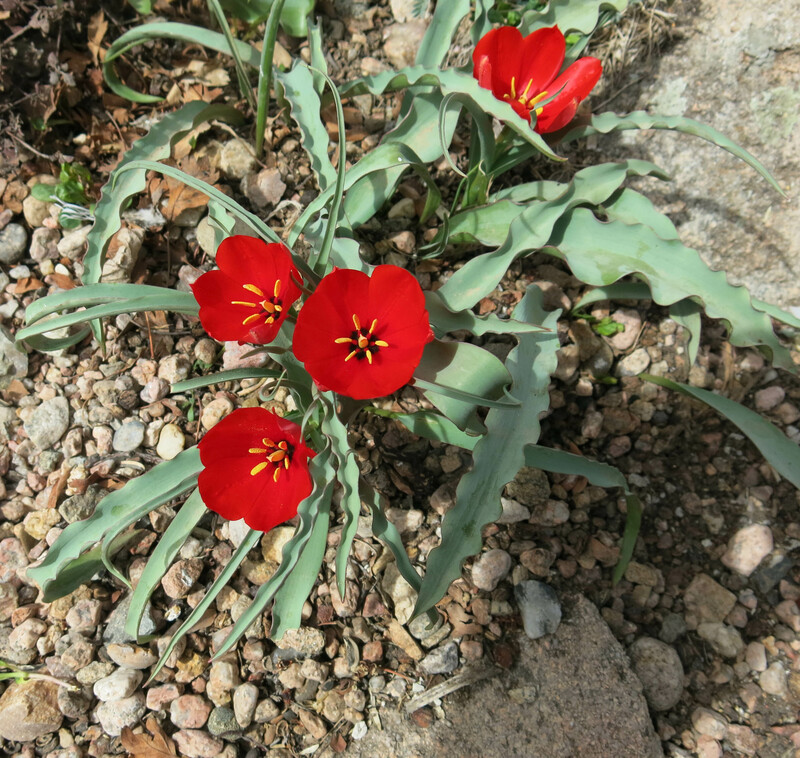 Might be Tulipa montana; I can’t find the label but one thing I do know is that it’s red. 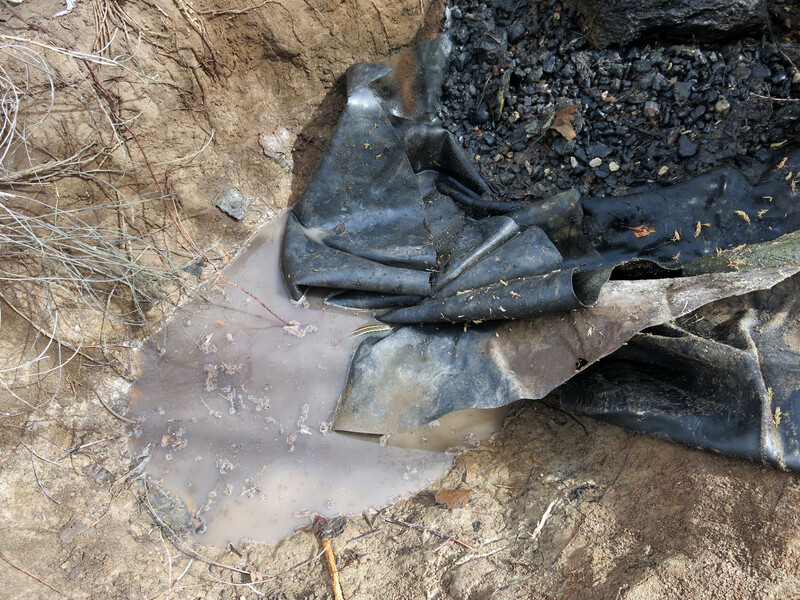 The odor of stagnant water is awful and no matter how careful you are when working around it, the smell gets on you! Just last night I found another repuslive garden smell whilst cutting rotting leaves off of an Agave weberi. Almost like rotting flesh. The flies sure flocked to it. Isn’t gardening fun? The late Christopher Lloyd said they’re just plant smells, but I don’t know …. “You smell really bad; you must be a gardener.” The growing of stapeliads in the house was banned the minute the first one bloomed. Huh, I never thought of leaving pans of water around for the garter snakes (I like them, so I will). A good population of snakes in the garden means a lot fewer mice, for one thing.